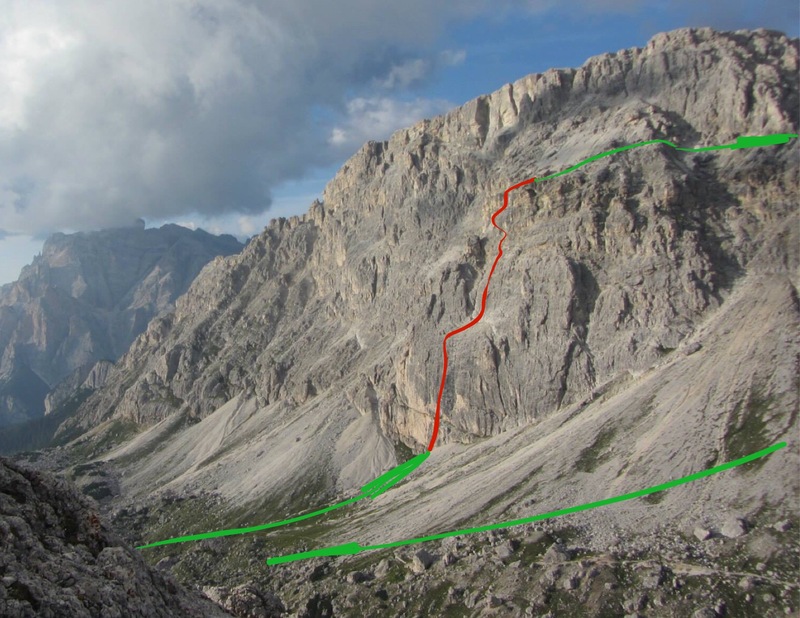 M.Speciale is a fantastic 300m route which climbs to the top of Piccolo Lagazuoi on a very direct line. 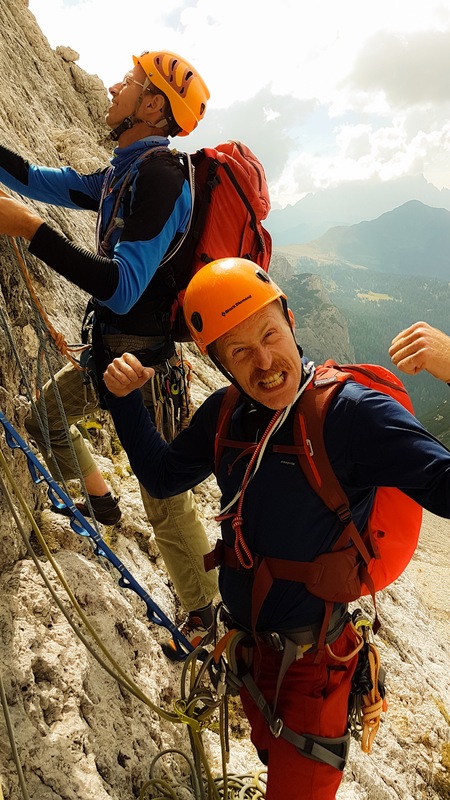 Its difficulty is a little discontinuous, but the crux pitches especially are really quite special, certainly some of the most fun climbing I’ve done of that grade in the Dolomites. It is airy, with highly pocketed and water worn grey Dolomite on the hard sections and is broken by a terrace at mid height from where you can escape to the right should you need to. Approach is fast and easy from Passo Valparola, where you park in a lay by opposite the old fort. Follow the Kaiserjaeger Path towards the base of the Lagozuoi and after climbing for some 15 minutes, strike out directly to the base of the wall up loose scree. 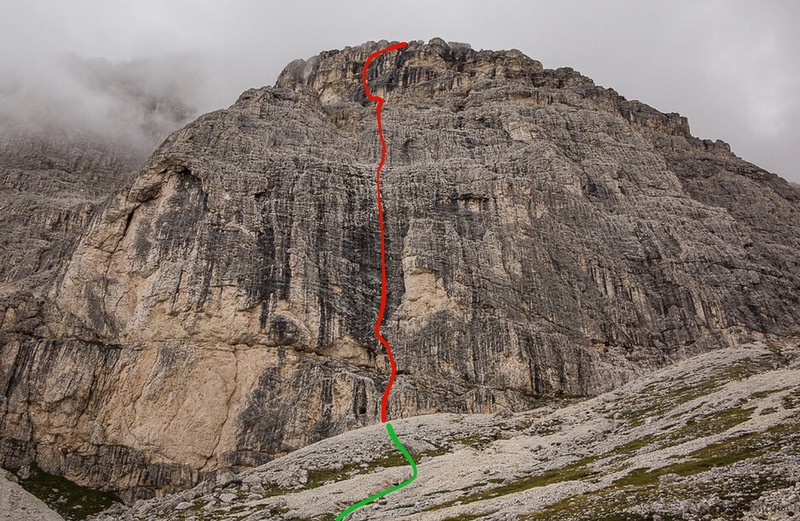 The route starts at an obvious chimney near the lowest point of the buttress and to the right of an overhang. There are a great number of threads on this route, many of them equipped with tat of varying quality. Stiff Kevlar cords and dyneema slings to thread these are useful. The rock is a touch tricky to place gear in, so a limited rack of a set of nuts and a few cams (0.4-1 Camalot) are useful. Double ropes are advised should you need to retreat during a storm as the pitches are quite long. Close up of the route. The best pitch is up the black water worn rock near the start. After a short easy chimney the route strikes out leftwards in a determined fashion across a rather blank wall; it has just enough good holds to make it relatively easy. There are a number of pegs to protect, but a few nuts also help. Shortly a belay in a shattered niche is reached where there is a peg belay. The next pitch is fantastic; steep and featured, it looks intimidating from the start. However you soon realise that you can follow a line of jugs which breech the wall and a couple of small overlaps. In a 35m pitch you reach a belay, again equipped with pegs although there are plenty of alternative placements should they be needed. It’s a small belay and not ideal for more than 2 people. 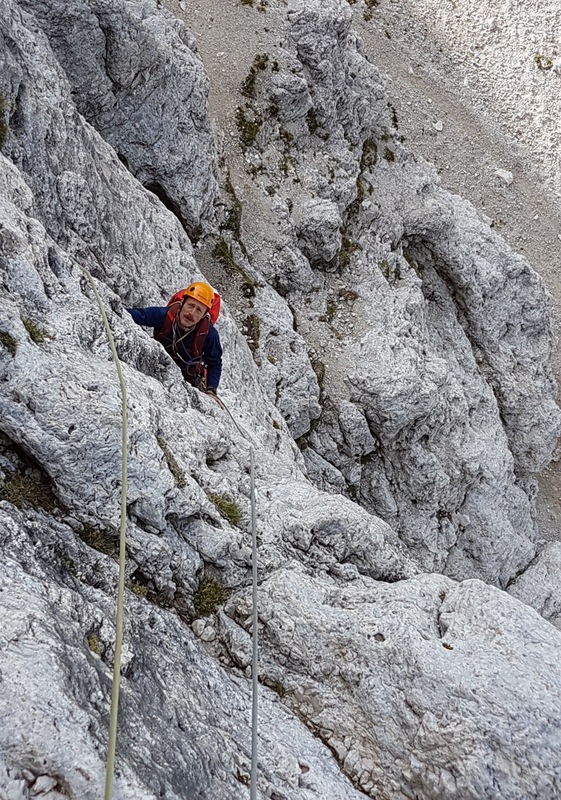 Federico climbing the steep, exposed and utterly excellent first pitch. From here you climb more easily to a terrace which is crossed. This the point at which escape to the right is possible, just be careful not to knock off rocks as there are a number of busy routes which climb the wall beneath it. All being well though, belay at the back of the terrace beneath a steep wall. Here you climb a fairly obvious weakness in the wall to a hanging groove. 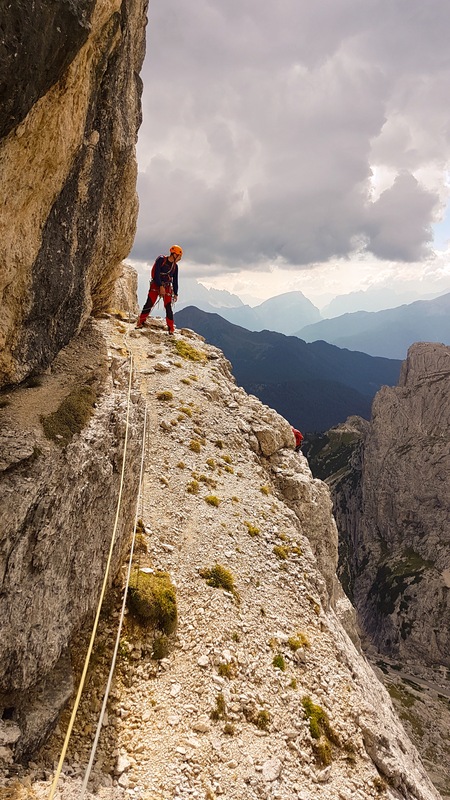 You reach another loose terrace with few good belays. Retrospectively I would search for something close to the edge of this terrace as the rock at the back is loose and shattered and provides little real security. Federico larking around on the terrace. What a spot. Climbing leftwards across this terrace you will approach a steep wall beneath a large black bulge. Climb until you find a rampline which leads back right wards into an open corner beneath the wall and belay to a thread and nut. Now strike out boldly leftwards, climbing through a first overlap and then a smaller second one with some difficulty. You will reach a ledge leading leftwards – do not be lured along this but instead climb quite directly to a hidden peg and from there to a large ledge. Here arrange a runner for your second and traverse the ledge leftwards to a peg belay beneath a crack in the overhanging wall above. Looking into the abyss from the last belay, just before the short hard crack. Climb this crack with some “urgency” to yet another loose terrace and belay. The exit of the climb is on the left, across scree covered ledges, at first quite steep and exposed but quickly giving way to an easy path. The descent is certainly not easy. You must be sure footed and comfortable with quite tricky scrambling. According to the guidebook we had, after traversing ledges rightward, you find some pegs for an abseil. We never found this, and instead followed first a large terrace and then increasingly narrow ledges eastwards across the mountain until we reached a large slope above the East face of Piccolo Lagozuoi. There we picked up the top of the Kaiserjaeger path which is equipped with a bridge and cables to protect exposed sections. We followed this directly back to the carpark in around 25 minutes, the whole descent taking about an hour.